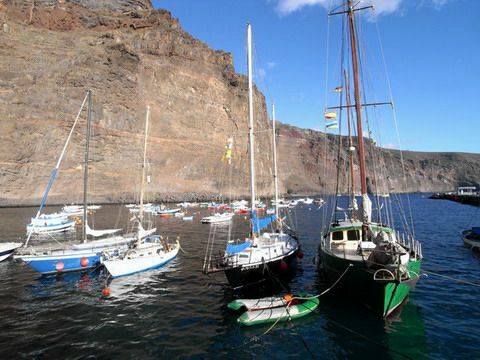 The legendary valley of the great king has become a popular holiday destination of La Gomera. A terraced landscape, numerous palm trees and colourful gardens give the valley an unique flair. A well maintained road curves down into the valley, once well known for it’s seclusion. The road passes impressive cliff-faces and idyllic settlements. Thanks to the warm climate, many tropical fruit trees and bananas grow here. The valley opens up at the delta to the sea. 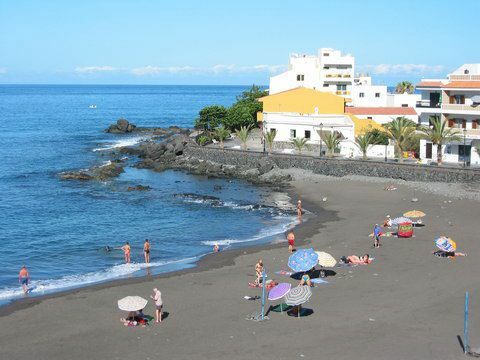 At the beaches of the area, you can meet many tourists and locals alike and enjoy swimming in the Atlantic. At night, enjoy spectacular sunsets to the beat of drums, cosy restaurants and bars. More images can be found in our gallery of Valle Gran Rey. The valley in the west has some of the most beautiful beaches of the island, such as the fine-sandy Playa de Ingles, the long Playa de Valle Gran Rey or the the protected Charco del Conde. Map of the Valle Gran Rey in the south-west area of La Gomera (Canary Islands, Spain). 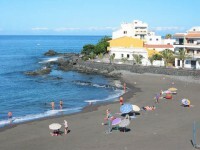 People meet up on La Playa’s small promenade, and relax in the terrace cafes, or on benches under the palm trees. 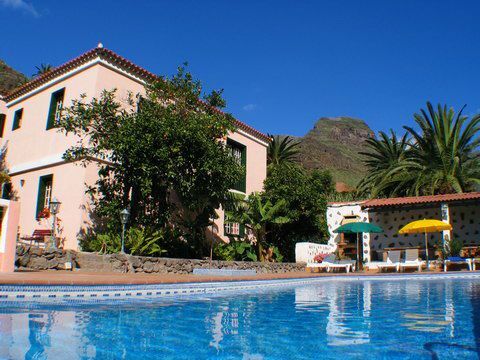 La Playa is a beautiful place for a Gomera holiday by the sea in the Valle Gran Rey. 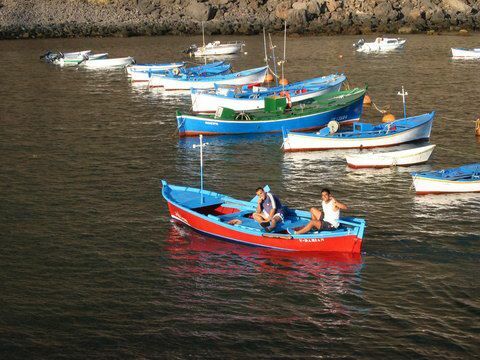 Attractive hotels and holiday complexes can be found around La Puntilla’s small lagoon Charco del Conde. 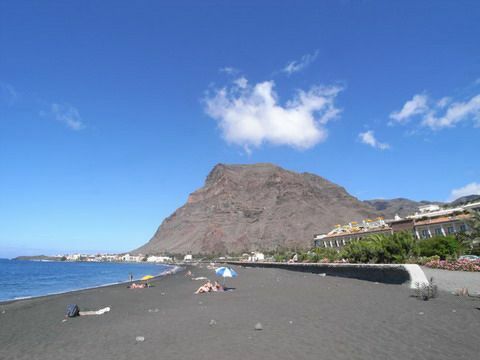 Anyone holidaying in La Puntilla will enjoy how close the beaches are. Situated on a mountainside, in the Valle Gran Rey, La Calera is a picturesque place with idyllic stairways and lanes. It has accommodation for hikers and holidaymakers searching for peace and quiet. Vueltas boasts the harbour of the Valley of the Great King. This traditional town has many rustic bars, nice restaurants and some independent accommodation. Borbalan is a quiet town in Valle Gran Rey, situated between the sea and the slopes of the valley. 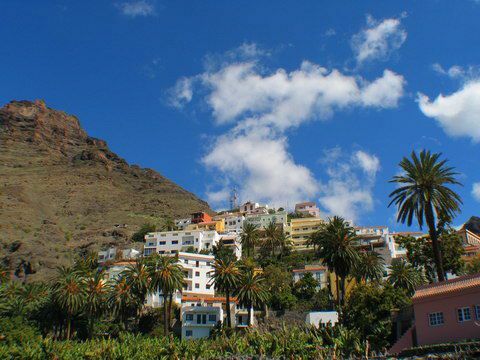 Banana plantations and fruit trees surround Borbalan and its houses, which stretch from the traditional town centre to the harbour. Hikers treasure the upper valley of the Valle Gran Rey. The sea can be reached quickly by rental car. The original small settlements are mainly populated by Gomeros. They valley gets it’s name from the legendary king Hupalupa. 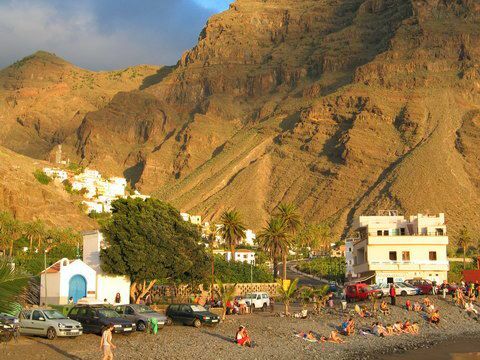 In the pre-Spanish era, the fertile valley was the home of the ancient Canarian king. Tales tell of his beautiful daughter, who, together with her father, could stop bad things happening to her people, thanks to her psychic abilities. It is also told however, that the king’s son tried to sabotage his father’s plan to kill the Spanish tyrant Peraza. Because of this Hupalupa stabbed his own son in front of his people. Tourist-center of Valle Gran Rey directly on the beach. Around the lagoon Charco del Conde and close to the beaches. Typical canarian flair and with amazing views. The protected port of Valle Gran Rey. Between the ocean & the steep slopes. Traditional district with colourful gardens.